Definitive prostate cancer diagnosis can only be made through histologic evaluation of prostate tissue. Transrectal ultrasound—guided, 10- to 12-core biopsy is the gold standard for practicing urologists and should be routinely used in initial evaluation because this examination contributes significantly to risk stratification models for men with localized cancer. 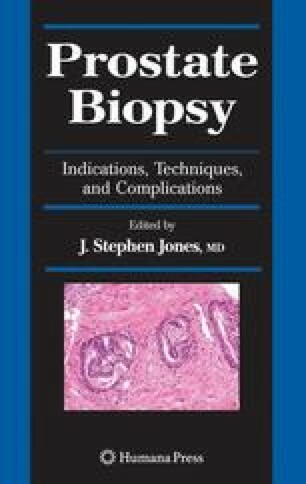 Anterior biopsies may be less significant than other samples in extended biopsy schemes. A greater number of lateral and transition zone—directed needle biopsies may be recommended in men with critical risk factors such as advanced age, substantially elevated prostate-specific antigen (PSA) level, or prostate volume >50 cc. PSA density and PSA transition zone density are also useful in distinguishing prostate cancer from benign prostatic hyperplasia. The diagnostic value of needle cores is greatly increased if the cores are divided into separate sample bottles, thus pathologic results would be more informative and useful in determining the prognosis of prostate cancer. Simply separating cores into two bottles by laterality has important clinical significance, serving as a guide for repeat biopsy and/or focal therapy if its role becomes established. However, many clinicians do not practice these measures because they increase the cost of biopsy screening.